Telco regulatory body the Australian Communications and Media Authority (ACMA) has released its latest report into customer service performance from Aussie mobile and internet providers, giving a small glimpse into just how (and how well!) major telcos communicate with their subscribers. The ACMA report looks at telco-submitted statistics from 2017-2018, compiling customer service info from Australia’s five biggest providers. Unfortunately, the ACMA isn’t able to publicly identify just which telcos comprise the top five, so there’s no way for customers to know exactly how their current carrier fared. But judging from subscriber base and known size, it’s likely that the five telcos analysed consist of Telstra, Optus (including Virgin Mobile), Vodafone, TPG/iiNet, and Dodo/iPrimus. In the 2017-2018 period, the five featured providers handled over 88 million customer inquiries, complaints, and service requests. Overall, the humble telephone is still the most popular way for Australians to get in touch with their telco company, accounting for an average of 79.8% of all contact. Less popular channels included online live chat (about 15.5%), social media (2.7%), and email (1.5%). A big pain point for customers is being subjected to hold times when attempting to resolve a telco complaint. But there’s good news for impatient callers: the average call wait time over the report period was a tolerable one minute and fifty-four seconds, with three of the five telcos surveyed recording average times of under two minutes. Telco B and Telco A offered the most consistently prompt service, averaging wait times of 51 seconds and 59 seconds respectively. 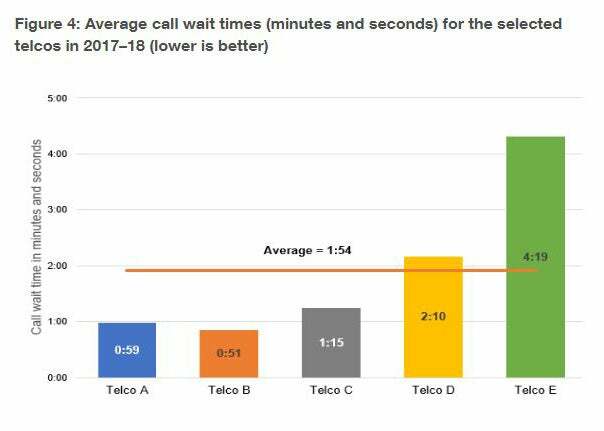 However, Telco E’s wait times were less impressive, with an average of four minutes and nineteen seconds – a result that, unsurprisingly, is reflected in the average rates of call abandonment from its customers. In comparing the average number of callers losing patience with wait times – and hanging up before speaking to a representative – Telco E totalled an average of 15.3% across the year-long period, almost double the average of 8.1% for all telcos. In comparison, Telco A logged an abandonment rate of just 4.9%, Telco B and Telco C each recorded 6%, and Telco D 8.2%. With Telco E offering longer-than-average hold times, it’s not a shock that customers would be much more likely to abandon their call early due to frustration. 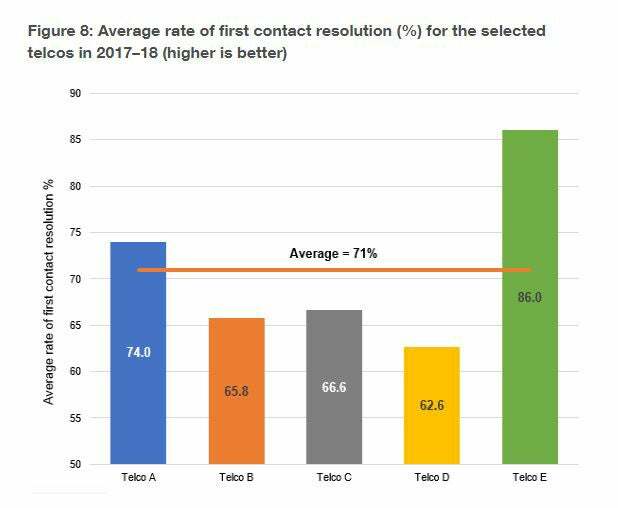 However, the ACMA also recorded the average number of complaints or inquiries that were resolved by telcos at the first point of contact – and despite the poor performance in previous categories, Telco E is apparently nailing it. Longer wait times = faster complaint resolution? With an average of 86% of issues resolved in the first instance, Telco E is head-and-shoulders above the total telco average of 71% for 2017-2018. The next highest resolution rate was from Telco A, at 74%, followed by Telco C (66.6%), Telco B, (65.8%), and Telco D (62.6%). So although Telco E may struggle with answering phones on time, its customers appear to be receiving high-quality service once they actually get through. Perhaps the above-and-beyond customer service Telco E offers means representatives are spending longer on individual calls, rather than flying through conversations in an effort to answer calls faster. Without being able to identify which company ‘Telco E’ actually is – or indeed, any of the five anonymous telcos – it’s difficult to speculate. Overall, the ACMA report is a general snapshot into how the five biggest telcos are handling customer contact. With lower wait times, and a generally high rate of solving problems first-go, it seems telcos are working to deliver better customer service across all channels. But even with advances in online communication methods, most Australian consumers would prefer to speak directly to their provider over the phone, rather than drag out an issue through Facebook, online chat, or email. We want our questions and complaints resolved on-the-spot, and don’t have a lot of tolerance for back-and-forth buck-passing or irritating wait times. So although providers offering alternative channels of contact helps, efficient call centre service still seems the key to keeping customers satisfied.